Rowers from across the north of England and Scotland converged on Durham City on Saturday February 3rd for the annual Durham Small Boats Head, a time trial over 1800 metres of the River Wear with nearly 400 crews taking on the course, starting at Count’s House and rowing through the arches of Elvet Bridge to finish near Durham Amateur Rowing Club. The event proved as popular as ever with entries reaching capacity two weeks early. In calm but drizzly conditions competitors in quad, double and single sculls, fours and pairs from as far afield as Bradford, Lakeland and Edinburgh joined those from the north-east clubs, schools and universities to take up the challenge, with entries spread across the junior, senior and masters age spectrum. Times achieved over the four divisions were compared to determine the overall winners in 60 contested events, with a prize awarded to each winner. The fastest crew overall was Durham ARC’s J18 junior boys’ coxless quad of Harry Coe, Josh Stephenson, Matthew Skinner and Matthew Edge in a time of 6min 16.7sec, one of 18 wins for the club, the most successful club of the day, followed closely by Chester-le-Street ARC with wins in 14 events. Wins were shared between 15 different clubs. 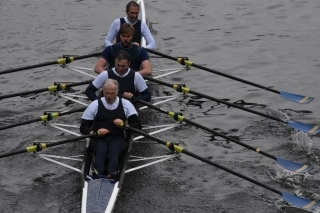 Durham ARC performed well in the sculling events with wins for the senior men’s squad in the Open coxless quads for Reece Stockport, Can Evirgen, Mert Evirgen and Will Hamlyn in band 1 (6.37.9) and for David Rutter, Nicholas Baird, Nick Spong and Brad Knights in band 2 (6.35.4). 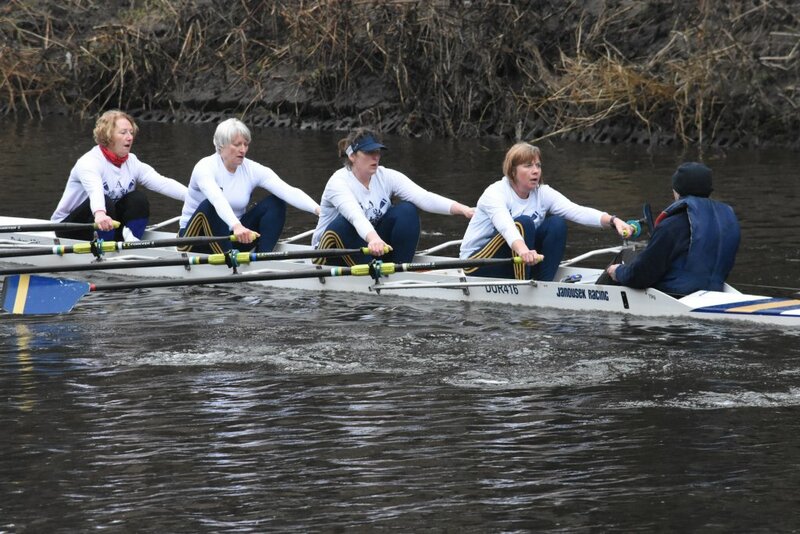 Another victory came for Beth Holmes, Rachael O’Connor, Alison Danforth and Taya Parker in the senior Women’s coxless quad (7.19.9). Further wins came in the Open double and the J14 girls coxed quad sculls. 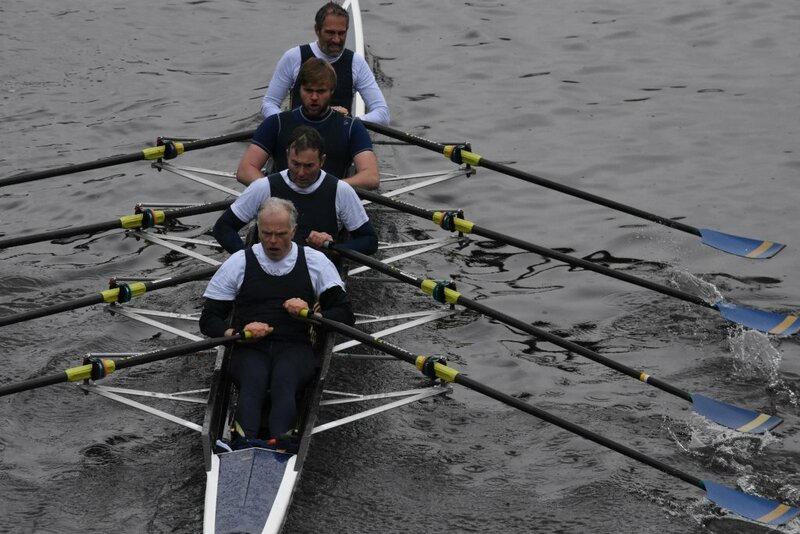 Durham’s Masters squad won ten events covering an age span from 27 to 70, including the Masters BCDE coxless quad with the overall 5th fastest time of the day, 6.36.7, coming from Richard Court, Brad Knights, Paul Rutter and John Lyons. Christine Heppell, Gabrielle Moore, Susan Jackson and Angela Lund won the Women’s Masters D coxless quad, Nicola Field, Linda Forwood, Vickie Jackson and Julie Kitson, coxed by Andy Jaggard, took the Women’s Masters DE coxed quad, and there was a win in the Masters EFG coxed quad for David Green, Steve Auster, Vaughan Gordon and Colin Lawson, coxed by Helen Adair. 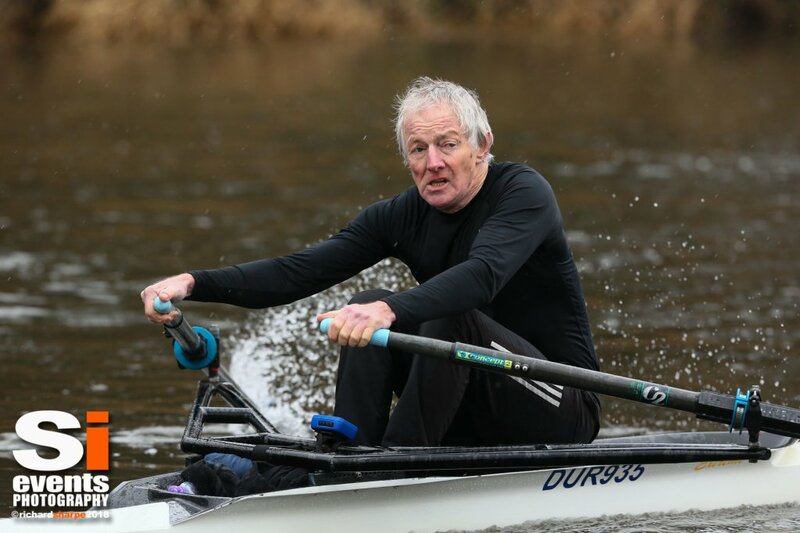 In the smaller boat categories success went to Durham’s John Appleby and Micky Stevens in the Masters EG double sculls, and to Gill Prescott and Helen McMillan in the Women’s Masters EG double. David Muse won the Masters ABC single sculls, Andy Jaggard the Masters F single and John Appleby the Masters GH single, while Kim Forster took the Women’s Masters BC single. 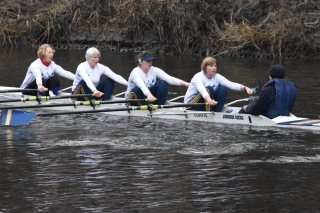 Wins for Durham ARC in the sweep-oar discipline went to Becky Chilcott and Kate Sowden in the Women’s pair, and to the Women’s coxed four in a composite crew with St Leonard’s and Durham School. Full results can be found in PDF and XLSX formats along with Results by Boat Class (PDF). Another team facing a challenge in 2018 is the one from Tyne Amateur Rowing Club preparing to row across the Atlantic in the Talisker Whiskey Atlantic Challenge, due to set off in December. Seeking sponsorship the team brought their boat to Durham on Saturday. To find out more go to the Team Tyne Innovation website. This entry was posted in Racing News, Uncategorized on February 7, 2018 by Colin Lawson.